There probably doesn't exist a community around which so many opinions, ideologies and myth-conceptions converge as our HiFi community. Hifi is not an exact science, it's more a phenomenon. 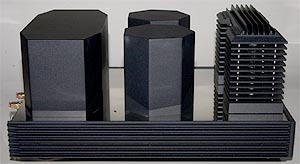 Physics and perception, two academic sciences, are combined with gut feeling and a form of amour propre in order to build or at least put together a system that Le Corbusier would have described as a Machine à Ecouter. And this machine should be able to alter our mind state so we can enjoy the emotions of music. No wonder that the roads leading to such a machine are diverse, narrow, winding and full of threats. Take a man like the far-too-early deceased Riccardo Kron. Born in Italy as the son of an Austrian mother and a Hungarian violist for his father, his whole youth is filled with live music. The Scala is more or less his playground, music nothing special since it's everywhere around him. More special is the world of electronics and the wide availability of tubes from army surplus right after WW II. Tubes in particular create seeds in the fertile soil of Riccardo's imaginative mind. Together with a group of friends, he builds radios, transmitters and even a rudimentary TV. After a successful business study, we now find Doctor Kron and his employer in an Italian manufacturing plant of radios and television sets. Other electronics and tubes are put on the back burner, Riccardo's life with his wife from New York goes on - until the day that finds Riccardo browsing through small stalls in an open market. There's a man from Prague who will completely change the Krons' life. Together with a few others, the man owns the former Philips and later Tesla tube factory. There in the Czech Republic, they produce vacuum tubes under the name VAIC, after the Czech man's name - Alesa Vaic. The old whish, to create a device that can reproduce music as it should, is sparked back to life with Riccardo. 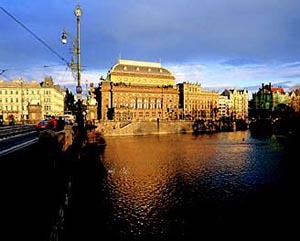 The Krons invest in the VAIC Company and even move their household to the Czech Republic's beautiful Praha. The outcome? Two wizards of tube technology work together in a place where tube history is literally written all over the walls. The quality of VAIC tubes rises to previously unknown heights as Riccardo introduces quality control and serial numbers. However, two brilliant minds can only work together for a limited time. In 1994, the Krons attract some investors and launch KR Enterprise, a venture totally dedicated to audio tubes. This risky business takes over three years and a lot of money to introduce a whole range of high-quality, long-life HiFi tubes. Made by hand, all valves feature a vacuum inside their envelopes that's even higher than that found in outer space. Building the best tubes in the world, the Krons soon find buyers using them in off-beat or questionable designs. 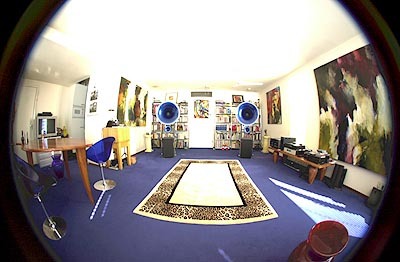 For consumers, the resultant sound is not due to their amplifiers, heck no, it must be those tubes! Now Riccardo and Eunice address the task of designing their own amplifiers, not outgrowths from Popular Electronics topped off with a glowing KR cherry. No, Riccardo starts with his particular tube architecture and designs a whole special circuit around it, aiming at the sound he grew up with - his father's violin, Maria Callas in the Scala; that's the goal. And that sacred goal has to be reached no matter the ideological or financial costs. The result is a design that combines solid state and hollow state techniques: Driver stages are solid state, the output stages hollow - the best of both worlds. Besides hybrid amplifiers, KR Enterprises develops new tubes, all of them triode designs and evolutions of classical models. The Western Electric 300B, godfather of the triode, consists even in today's incarnation of a mere 28 parts. KR's rendition of this tube? It employs 128 parts to form the cathodes alone. For building blocks, KR uses metals new to tube fabrication. For example, the KR 52BX and new KR 842 VHD sport titanium for the plates. The top-of-the-line masterpiece remains the KR 1610, a 32cm tall monster tube, the center of the Kronzilla as immortalized by the late Harvey 'Gizmo' Rosenberg with a bow to the Japanese. Life's unfairness strikes in 1999 when Riccardo is diagnosed with a terminal disease. The time left to him is used for buying out all investors (which changes the company name to KR Audio) and accelerating the final training of his technical right-hand man, Marek Gencev. When Count Kron passes away in late 2002, Eunice and Marek are ready and prepared to continue Riccardo's work. Said collaboration works wonders. At the last Doelen Hifi Show in Rotterdam, the city with the world's largest port, their first proof of new excellence is the new KR Audio Antares VA 320 dual-mono power amplifier. This Antares receives the nickname Baby Kronzilla because the build and sound characteristics mirror a scaled-down Kronzilla. Only a few weeks after this show, the Antares arrives in its crate for evaluation to our listening room. Getting the amp out of the box is proof positive why (tube) audio is mainly a guy thing - it takes sheer muscle to lift this 35-kilo beast from its shipping container. While perhaps lacking the muscle part, the odd female audionautrix will throw other capabilities into the ring to seduce a man into the necessary lifting. 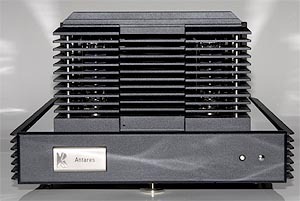 The Antares VA 320 is built like all KR audio tube gear - a slim flat box, here 53cm deep x 36cm wide, is equipped with cooling fins on the long sides. The front sports a nameplate, a miniature push switch and an LED. From left to right, the back shows the mains switch, power inlet, loudspeaker terminals and input RCAs. Output impedance can be adjusted to 4-, 6- and 8-ohm speakers by means of setting two screws -- usually covered under a small plate -- into one of three possible positions. The input sensitivity is 1VRMS/47KOhm, input impedance 100kOhm. Atop the base's stainless-steel cover, KR Audio has placed four monolithic structures. At the back, there's a big longitudinally octagonal black box housing the input/power transformers. The old knock-on clearly shows the absence of internal dampening. The following two seven-sided structures house a potted output transformer each and are completely dead when tapped. The last structure upfront reminds one of East-block architecture, perhaps a scaled-down housing block from the Stalin era. Rather than solid, it's home to the twin KR 842 VHD power triodes, the firm's latest development in the greater 300B family of valves. The VHD addition stands for Very High Dynamics, with output power good for 12 Watts in the VA300 amp version and 20 watts in today's upgraded stereo amplifier. The power tubes employ a cathode resistor bridged by a capacitor to turn the circuit auto-biased. When a tube needs replacing -- highly unlikely during our lifetimes -- there's no need for adjustments. We set the amp for 8 ohms and, with fine silver conductors encased in cotton, connected our Avantgarde Duo loudspeakers in a discreet tri-wire configuration. The CD spinner was a CEC TL5100, its signal passed to an Audio Note DAC2 Signature and then a TacT RCS 2.0 in passive preamp mode. Each component, including the Avantgarde subs, benefits from its own Omtec power conditioner to filter out unwanted noise from the 220-Volt net. Before powering up the Antares, two protective silicon rubber transport rings have to be removed from the power tubes' tops. After this simple procedure and a final check for proper connectivity, all components were powered up in sequence, starting with the CD player, RCS, DAC and Antares. The amp's LED starts off red. After a minute of circuit stabilization, it should become green, indicating that Baby Kronzilla is ready for its musical feeding frenzy. When the anode current reached the tube, we heard a minor but noticeable thud from the active Avantgarde subs. This transient could be avoided but then the circuit would need a relay and make it less reliable. Using extremely sensitive loudspeakers like the Avantgardes not only bestows very positive effects but downsides, like the ability to reveal each and every flaw in the other components of the signal chain. Less sensitive speakers simply omit the transmission of certain flaws. Which is better? Hard to say, but we like the less forgiving Duos. In case of the Antares and after many hours of warm-up, the speakers not only transmitted the very low thud upon first turning the amp on but also a slight hiss. However, this remained utterly inaudible with our other set of loudspeakers, the Audio Note AN/Jsp, good for 'only' 93 dB/2.83 volt/1 meter. Twenty watts on a 105dB Duo is flat-out deafening by the way. After again powering up all equipment, we gave Astor a second chance. What an immense difference! The concert captured on this CD is a unique collaboration between two of the world's greatest tango orchestras, the sextet of Piazzolla and orchestra of Oswaldo Pugliese joined together on stage for the first time ever. The dynamics now were fantastic, the addition of the VHD moniker to the tube's numerical nomenclature clearly not just a label. Attacks were attacks blasting off from a deep black background. Long strings were really low unlike with a classic 300B SET amplifier that has a hard time supporting the lower octaves. Swapping output transformers for toroidal or silver version will help, just as providing the driver stage with a separate power supply. 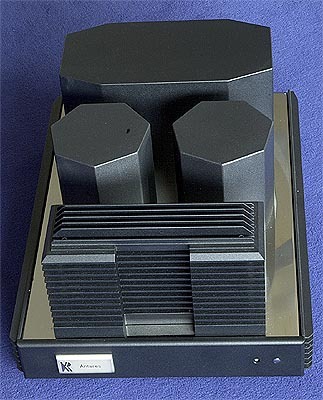 Interestingly, the dual-mono concept in combination with the solid-state driver stage here did not alter the intrinsic single-ended triode, no NFB Class A character of the amplifier. Only now it was on steroids. Other recordings followed. Time after time -- whether Miles or Cindy -- the ease and superiority of the projected sound image was striking. 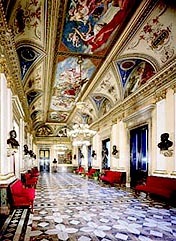 Classical chamber and large orchestral fare, jazz and other music recorded in large halls or intimate rooms all arose from an inkily black background. A hit cymbal appeared all of a sudden, silence-attack-sustain-decay-silence, not something-attack-sound. 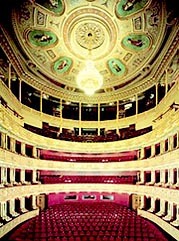 Musicians stood or sat on their respective spots and remained clearly defined in height, width and depth. Space and silence are two parameters of the image, the illusion. Music of bands and singers playing in the streets of Havana and recorded in open outdoor space portrayed the warm air like an envelope - Cuadernos de la Habana [Winter & Winter 30, 1999]. Music was brought into the room without effort or strain, making us listeners want to turn up the volume a little. Even at high volumes, there was no trace of limiting compression. Where a classical 300B SET amp with 6SN7 input tubes displays audible microphonics at high volumes, the KR Audio Antares with MOSFETS and highly dampened 842 tubes gave no sign of this malady. What about negative aspects of the Antares VA 320? There are some, sure, though they're minute. A highly commendable thing about KR Audio is how they respond to and implement solutions to reviewer criticisms. The predecessor of the VA 320 did not feature a stand-by switch, the IEC inlet was too shallow. These things have all been addressed. Now our negative feedback points at the lack of a grounding terminal. We needed to run a wire between the DAC's analogue ground terminal and the VA 320 to banish hum. Just placing the end of this wire under one of the metal feet of the amp did the trick. Somewhat of an eye sore, yes - but hey, no hum. In conclusion, the Baby Kronzilla is a very special amplifier, far more affordable than the big Kronzilla but with all its unique characteristics intact. 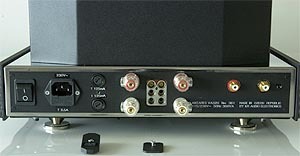 The 20wpc rating limits the use of accompanying loudspeakers to the more sensitive kind, say 90dB/2.83V/1meter and higher, with bandwidth as low as possible ideally matched. The Antares does not add anything to recorded music. It simply enables the music to come to full bloom, effortless and with great authority.